A puff pastry crust means no fussing with homemade pastry, making this chicken pot pie relatively easy to put together and bake. The savory, creamy chicken filling includes sliced mushrooms and peas, but feel free to change the vegetables with your family's favorites. Use cooked carrots and potatoes or a mixed vegetable combination, and feel free to omit the mushrooms. 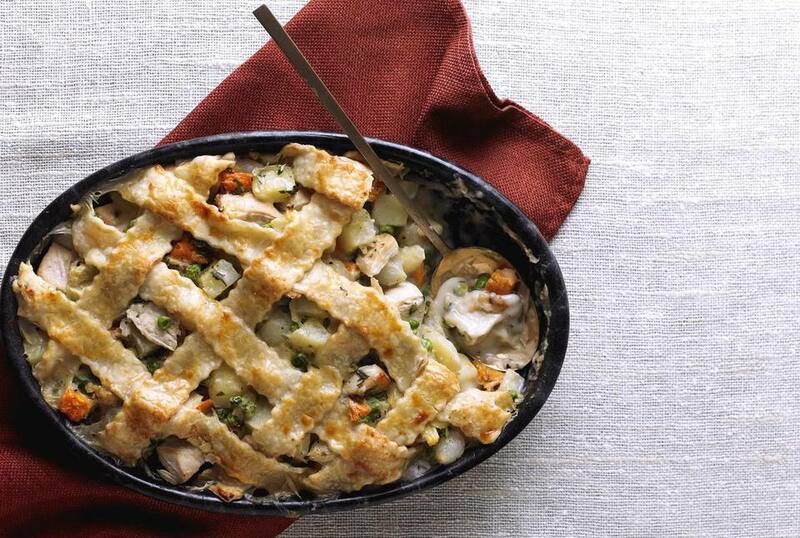 Serve this delicious chicken pot pie with a tossed salad for a satisfying family dinner. Put chicken in a large Dutch oven or kettle. Add water, chopped garlic, chunks of onion, 1 teaspoon salt, 1/4 teaspoon black pepper, and the marjoram or thyme. Bring to a boil. Reduce heat to low, cover, and simmer for about 1 1/2 hours, or until the meat is falling off the bone. With a slotted spoon, remove the chicken to a large platter to cool. Place a mesh sieve over a bowl and strain the broth. Discard solids and put the broth back in the pot. If desired, skim off any visible fat. Bring the chicken broth to a boil and continue boiling for 5 to 7 minutes, or until reduced to about 2 cups. Set aside. Separate the chicken meat from the bones. Discard the bones and skin and chop the meat; set aside. You should have approximately 3 to 4 cups of chicken. On a floured sheet of parchment paper, roll out the puff pastry sheet to an inch or two larger than the baking dish. Slide the pastry—parchment paper and all—onto a baking sheet and place it in the freezer until you're ready to bake. Melt the butter in a large saucepan over medium heat. Add the sliced mushrooms and cook until they are golden brown and tender, stirring frequently. Add the green onions and continue cooking for 1 minute. Sprinkle the flour over the mushrooms and onions and stir to blend. Add the reduced chicken broth, heavy cream, and sherry. Continue cooking until thickened, stirring constantly. Add the cooked peas and chicken to the pan. Taste and add salt and pepper, as needed. Spoon the filling into the prepared baking dish and set aside to cool slightly while the oven is heating. When the oven is hot, fit the pastry over the baking dish and crimp edges (if it's too stiff, give it a few minutes at room temperature). Cut a small hole in the center or cut slits with a sharp knife. Alternatively, cut the pastry into strips and weave a lattice crust. Place the pie in the oven. Place a baking sheet under the baking dish or on the rack below the baking dish to catch drips. Bake the chicken pie for 25 to 30 minutes, or until the pastry is golden brown and the filling is bubbling.